Wouldn't leaving the 140 as it is, with the addition of the X140, and extending the 350 from Hayes to Ruislip be a better option? Come this weekend they will have a few spare from the C2 reduction. Or just divert the H98 to Ruislip and this will link Hounslow with Ruislip. Without sending something away from Ruislip there's no stand space for a new route either. Perhaps TFL could put a bus stand at Rayners Lane and send the 278 to Rayners Lane. Linking Eastcote and Rayners Lane to Hayes and Heathrow. It's worth noting that most Tesco superstores always have some sort of bus stand provision erected with the construction of its retail outlets. Gallions Reach and Barking Tescos are the local examples closest to me; with Gallions Reach actually having a decent 40m or so bus stop and stand on the perimeters of their carpark. That doesn't mean TfL will use their noggin and take advantage of this though!! I thought I would take a quick look at the 207, 427 and 607 patronage and my "rough and ready" capacity calculation. 427 - carries 8.1m pass jnys, demand down just 1% over last 3 years but overall trend since its creation is up. Has only 200k spare seats a year - in other words close to capacity. 607 - carries 7m pass jnys, demand down 8.7% over last 3 years but overall trend over 17 years is strongly upwards (over 109%). Is oversubscribed by 584k seats a year. Now clearly my capacity vs demand calculation is simplistic and cannot properly represent the geographic and time distribution of demand across the full Shepherds Bush - Uxbridge corridor. All I will say is that TfL must be making some very heroic assumptions about how people will use Crossrail given it has no intermediate stops between Acton and Paddington and will have an irregular skip stop pattern between Paddington and Hayes and Harlington. OK the 207 and 607 have lost some patronage - no doubt due to damaging roadworks in several places and other changes in transport use - but I do not see how you chop the 427 to the extent they are and expect other routes to take up the slack. 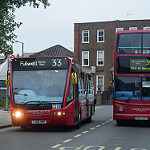 Yes the 195, E8 and 483 may pick up some very localised demand but anyone travelling any distance is going to be reliant on the 607 and possibly yet another change. If you want Acton Town Centre will you really travel to Acton Main Line and then walk or take a reduced bus service? I'd love to see some detailed data that actually supports TfL's decision making here as it doesn't make sense to me. I also realised when looking at the 266 changes that a journey I made a few months ago won't be possible on one bus in future - Acton town centre to Willesden Junction station. Currently very easy on the 266. In future I'd need to change buses at North Acton. For such a short trip and to a major hub of the Overground network this strikes me as utterly ridiculous. Acton Central is very badly located - no bus links and a longish trek into actual Acton - so it's not a particularly viable alternative. As I have never used the 120, 105, 95 or E5 north of Southall Broadway can someone say if there is any logic to TfL abandoning the hail and ride bit of the E5 in this area and moving the 95 away from what I assume is an area of housing? I know TfL want to "speed up" the 95 service but surely all it is a time saving made here to be expended on the southern extension through Southall Town Centre to the station? Is this a "non issue" for this area or do people who know the area feel there are problems with TfL's "fiddling"? The 427 reduction was only to be expected, new rail links inevitably mean reductions on parallel bus services. I think the 427 should at least go to Ealing Hospital but only time will tell how things pan out. The 218/306 don't give much of an overlap with the 266 and I think the question has to be, does the 266 really need to be withdrawn from Hammersmith? I know it's a long route by todays standards but inevitably when routes are chopped up links are lost. If you want a more reliable 266, then cutting it back is the only option really - it goes back to the same point I keep making about politicians needing to grow balls regarding a substantial reduction of congestion but it won't happen so expect routes to keep being trimmed as congestion increases. Hmm not entirely sure about your first remark. Yes there is a history of this happening in London. Yes some changes have been pretty severe - e.g. when the Victoria Line opened. However I think we have moved on somewhat from the late 60s or 70s or even the worst aspects of the 80s. A reduction I could probably cope with but the complete loss of a substantial section of route - I'm just not sure. If Crossrail properly paralleled the route then fine but it doesn't. It runs to the south and then the north and the stations are, in some cases, some distance from traffic generators served by the Uxbridge Road buses. I also don't see older people or those laden with shopping or with a young family in tow taking a bus then Crossrail then another bus for a longish but still local trip. Going to Central London then that's more likely as the train would bring a big time advantage. My worry with the Acton changes is that a number of shortish local trips become needlessly difficult - someone cited the West Acton to ASDA example. No matter how you describe it changing buses at North Acton is not nice. Horrible modern blocks, a busy gyratory road system, not a lot of footfall. 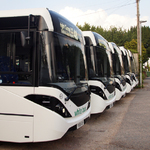 Imagine having to change buses there in the midst of a storm or a freezing cold winter's night. For all the changes to the 440 it will still be half hourly evenings and Sundays and yet the 218 round the West Acton loop will be x15 at those times. Imagine if you live at West Acton, want to reach ASDA on a Sunday and just miss the 440 - 29 minute wait or a schlep across the A40 and hope for a 260 or a 487. Faced with having to change at North Acton I probably would not bother at all. Also does the West Acton bit of today's 440 really need 50% more daytime buses and 100% more evening buses and double deckers at that? Looks like overkill to me. There's no doubt the 266 is unreliable - it took three buses to ride it end to end due to sudden curtailments due to late running. I can understand TfL wishing to improve the reliability but not entirely convinced Acton is the right curtailment point. I made a mistake in my post last night - I'd got it in my head the 266 was being curtailed at N Acton rather than Acton High St. Therefore not quite so many links are lost but I've never seen an empty 266 east of Acton High St heading towards Brent Cross. There is carry over traffic and I expect a fair proportion is going beyond North Acton (218 terminus). There's also the issue about whether people travelling from east of Acton will want to schlep round West Acton on a 218. The actual overlap of stops between the 218 and 266 is going to be very small - they may only have 1 or 2 stops in common which may cause overcrowding in Acton where the pavements are not exactly wide. The more I think about all of this the less convinced I am. I'm open minded about whether cutting the 266 back to Acton is a good move or not but inevitably links will be lost if it is. I don't understand the bit about politicians and balls, the only way I can see of reducing congestion is road charging which inevitably won't be popular with many. Inevitably TfL are going to be trying to coerce as many people as possible onto Crossrail and removing or reducing a few competing bus routes helps in that respect. I agree that North Acton is not the best place to be changing buses but if the 266 has to be withdrawn from Hammersmith it's difficult to see what else can be done? The more I think about all of this the less convinced I am. My exact thoughts which is why I'm giving it a bit of time before I compose my reply to the consultation!